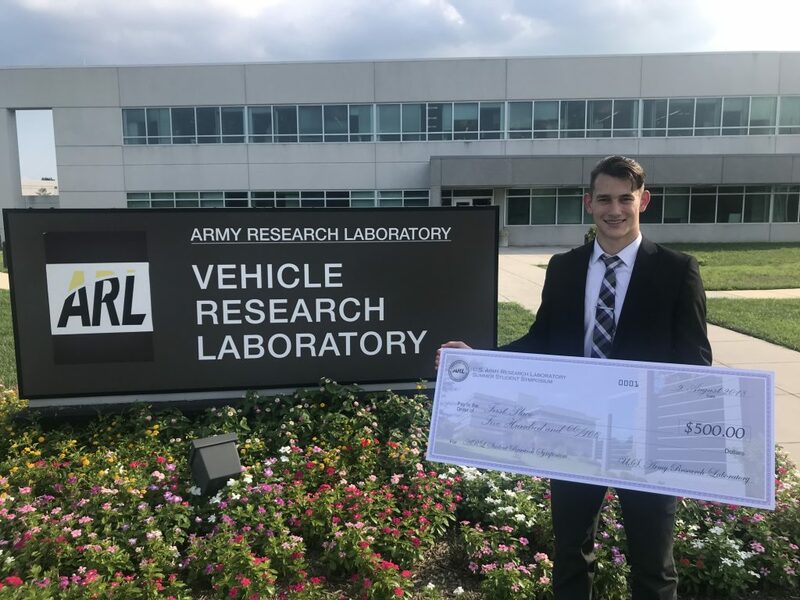 Kozak brings home the first-place award to the vehicle technology directorate as he poses in front of his summer’s research laboratory. Winning a single national research award wasn’t enough for one competitive mechanical engineering student. He wanted to win more. 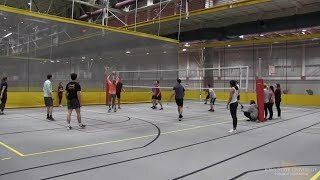 Nikita Kozak, a junior in mechanical engineering (ME), spent his summer as a Department of Defense High-Performance Computing (HIP) Intern at the US Army Research Laboratory (ARL) in Aberdeen, Maryland. The HIP program at ARL provides future workforce candidates with the critical skills needed to support the future Warfighter’s needs. 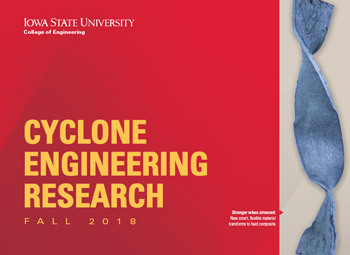 Much of his research success this summer was built upon his prior experience working on finite element simulations of wind turbines in the lab of Ming-Chen Hsu, an assistant professor of ME at Iowa State. When he first arrived at ARL he brought along a code that was developed by Dr. Hsu’s research group of the Computational Fluid-Structure Interaction Laboratory at Iowa State University which was a collaboration with ARL and others. This code modeled a single-stage gas turbine engine featuring turbomachinery blades that could be articulated. Kozak first had to implement this code on the Department of Defense’s (DoD) high-performance computing systems which provided the researchers of the DoD a turbomachinery analysis tool. Kozak said he was able to take the skills he’s developed in the classroom and apply them to his summer research. “The classroom instruction gave me a better understanding of complex framework and math behind the simulation as well as the theory behind how fluid mechanics and thermodynamics work,” he said, adding that he was also able to apply several concepts from his finite element analysis class that he took last summer while at Hochschule Mannheim in Mannheim, Germany. Kozak’s ARL internship culminated with two national-level competitions at the end of the summer. For the first, Kozak competed against 34 graduate and undergraduate students from the Vehicle Technology Directorate of the ARL. 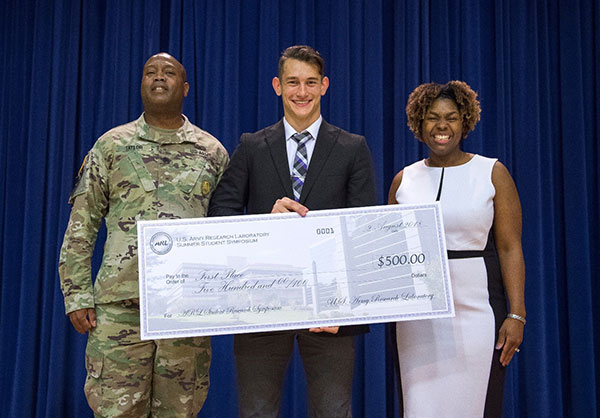 After besting the field in the undergraduate category, he qualified for an additional competition in which he competed against students from all departments within the ARL. Of the roughly 230 ARL summer interns, only eight undergrad interns qualified for the final competition, and Kozak again took the top prize. Pictured left to right are ARL Sgt. Maj. Keith N. Taylor, Nikita Kozak and ARL Outreach Coordinator Dr. Patrice Collins. Kozak said that he wouldn’t have won the competition without strong guidance and encouragement from HIP program PI’s and mentors Dr. Luis Bravo, and Dr. Muthuvel Murugan, both senior research engineers from the Propulsion Division at ARL. “They did an unbelievable job of engaging you in your work [at ARL]. 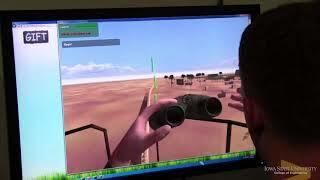 They make you feel like a collaborator as opposed to just an intern,” he said. Though he spent much of the summer in the lab, he was able to travel along the east coast on the weekends, visiting museums and other historical landmarks in New York, Philadelphia and Washington D.C.
Kozak attributes his interest in engineering to his parents, both of whom are engineers. Kozak and his family left the Ukraine and moved to suburban Des Moines when he was just two years old. 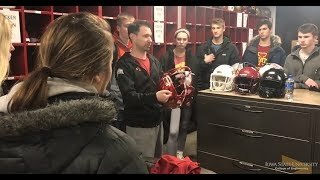 He graduated from Waukee High School in 2016 and he chose to come to Iowa State because of its proximity to his home as well as its reputation for engineering. Upon arriving on campus he found that ME in particular was a good fit for his career aspirations. Kozak plans to complete his bachelor of science (B.S.) in ME with a minor in mathematics in the spring of 2020. After graduation he hopes to attend a premier engineering graduate school. Kozak said that his passion for his work is what really drives him and advises incoming and current students to find a similar sense of pride in what they do.